To host an AWB training on the myths of “pinkwashing” and promoting constructive LGBTQ engagement with Israel, click here. “Pinkwashing,” a combination of the words “pink” and “whitewashing,” was originally invented by critics of corporations who marketed products and services featuring the color pink or the pink ribbon associated with breast cancer. These corporations were charged with making expanded profits with very limited proceeds actually supporting breast cancer research and support, and in some cases, were charged with using materials in their products linked with heightened risk of breast cancer. But LGBTQ people and allies embrace the rainbow. It’s time we start seeing Israeli and Palestinian people—and Israel itself—through a lens that reveals every shade of the rainbow, warts and all. Charges of pinkwashing distort the lens; calls for boycott and censorship shatter it. Now, more than ever, we must view Israel through a lens that shows the nuanced reality and illuminates the path toward a better, shared future. The fundamental problem with anti-pinkwashing rhetoric is that it proceeds from imagined motives to imagined outcomes, projecting invented intentions onto Israelis and North American supporters of Israel, including many non-Jewish allies in the LGBT community. Then it takes two unrelated topics—Israel’s LGBTQ communities and their progress in the struggle for equality and inclusion, and the Israel-Palestinian conflict—and asserts that they are inextricably intertwined. It implies that learning about and supporting the former will somehow magically dull people’s ability to think about and engage with the latter. Those who level charges of pinkwashing render LGBTQ and allied supporters of Israel invisible through caricature, pretending that we fit into a box of their own making. “The Cover-Up” Myth: A Wider Bridge and supporters are really about something else. Many LGBTQ Israelis are people of the left. Many of the Israeli LGBTQ leaders we bring to North America hold very critical views of the Israeli government and the status quo of the Israeli-Palestinian conflict. Even if it is not the main topic of discussion, audience members nearly always have some questions that in some way relate to the conflict—usually about the situation of Palestinian LGBTQ people in Israel, or occasionally about pinkwashing—and we and our speakers welcome that. Our guests respond with a variety of nuanced answers, which often surprise anyone expecting our speakers to parrot a single viewpoint. We don’t select the LGBTQ activists we bring to the U.S. based on their views on Israeli- Palestinian issues. Israeli LGBTQ communities, organizations, leaders, and artists existed long before the pinkwashing debate. The Israeli government didn’t conjure them into existence as part of a PR campaign; nor did they come into being to serve as a foil for BDS supporters and the anti-occupation movement. They are their own people with their own objectives, leading real lives, often with great struggles, and there is much we can learn from both their triumphs and challenges. 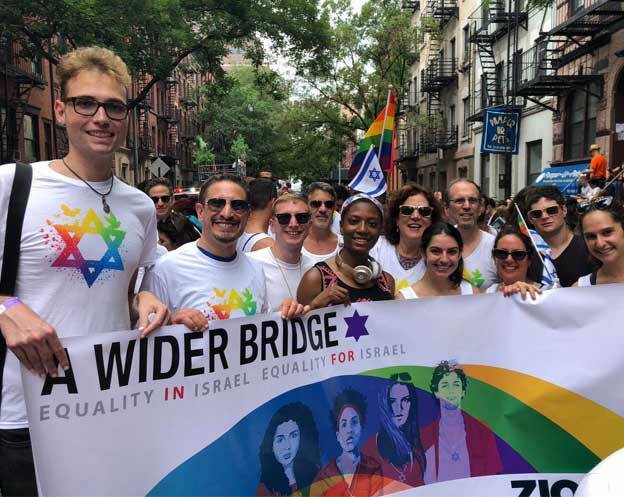 The “Master Hand” Myth: A Wider Bridge and other LGBTQ Israel engagement work are really just a mouthpiece of the Israeli government. To state the obvious, A Wider Bridge and our supporters are not surrogates for the Israeli government. We are clear about our own mission and objectives. We do believe in Israel’s right, like every other country, to conduct public diplomacy, whether as an antidote to demonization, to encourage trade and tourism, or for other legitimate purposes. We take pleasure in the fact that among the multitude of things that Israel chooses to promote about itself (and there are a great many facets of Israel in which to take pride and celebrate), it devotes a small amount of attention to its LGBT community. Where our interests converge, we are happy to cosponsor programs and work together. Yet sometimes the actions of the Israeli government on LGBTQ rights are not aligned with its rhetoric, and sometimes both the rhetoric and actions fall short of where they should be. We support many campaigns for change within Israel in this arena, including efforts to enact civil marriage. And we support our LGBTQ Israeli legal partners advocating for more compassionate policies regarding gay Palestinians who flee the West Bank and seek refuge in Israel because their lives are in imminent danger either from their families or the Palestinian police. The “Choose Your side” Myth: It’s either Israelis… or Palestinians. Example: “Pinkwashers aim to harness the global LGBTQ movement into supporting Israel at the expense of the Palestinians.” Exchanges with Israeli LGBTQ leaders “make invisible” and “marginalize” LGBTQ Palestinians. The anti-pinkwashing campaign of BDS activists helps feed the conflict itself by painting everything as a zero- sum game. Israel’s record on LGBTQ rights and its supposed treatment of Palestinians are positioned in some imaginary game of “tug of war.” If you are discussing one, your agenda must be to conceal the other. Yet celebrating gay rights in Israel has never stopped anyone, including our some of our more left-wing speakers, from criticizing the policies of the Israeli government toward Palestinians. Being pro-Israel doesn’t make one anti-Palestinian, just as being pro-Palestinian doesn’t automatically make one anti-Israel. These are false choices. What’s more, the idea that all gay people should automatically take either Israel’s or the Palestinians’ side in the conflict simply by virtue of being gay, as people on both the right and left sometimes claim, is equally misguided. In reality, it is often “pinkwashing” critics who seek to harness the global LGBTQ community in support of the “pro-Palestinian” campaign of boycott, divestment, and sanctions against Israel. We have never sought to cancel, boycott or silence Palestinian LGBT leaders, either in the United States or Israel. It is the pro-BDS movement that is attempting to silence and “invisibilize” Israeli LGBT leaders. The “First Amendment” Myth: “Anti-Pinkwashing” activists are for true free speech. Example: Those who agitate to cancel Israeli LGBTQ events are not violating the tenets of free speech. True free speech requires the airing of a diverse range of views at every event. For many BDS advocates, only the treatment of Palestinians may be spoken of—everything else is to be silenced and boycotted. For others, no conversation with Israeli LGBT leaders about the work of Israeli LGBT NGOs should be permitted unless it addresses the Israeli-Palestinian conflict. For these critics, speech is free only when it is “politically correct,” when it involves the “proper” range of political diversity, as defined by them. Arguments about diversity and an expanded agenda ring hollow. One single meeting can never be designed to satisfy everyone with divergent views. Must a panel of visiting religious leaders be canceled unless it includes atheists? Must a visit by the leaders of Planned Parenthood be transformed into a spirited discussion about the morals of contraception? When a delegation of visiting LGBTQ Palestinians tours the United States, should it have been criticized if no Israeli Jews are included? We do not think that should be the case. Pinkwashing has become the new straw man of the pro-BDS movement. It sees pinkwashers wherever it turns its gaze, much as the American right once saw “communists” lurking under every bed. If the pinkwashers are everywhere, BDS advocates have perpetual cause for mounting the barricades, now on Israel’s LGBT front. Discourse about Israel must be all about the conflict all the time, or face charges of bad faith. If every visiting Israeli LGBT leaders’ event can be cast as a bid to divert the attention of Americans away from the conflict, if anything touched by the Israeli government automatically becomes treif, there is always a simple choice between good and evil. Simple, all too simple. But LGBT people embrace the rainbow. It’s time we start seeing Israeli and Palestinian LGBT people—and Israel itself—through a lens that reveals every shade of the rainbow. Charges of pinkwashing distort the lens; calls for boycott and censorship shatter it. Now, more than ever, we must view Israel through a lens that shows the nuanced reality and illuminates the path toward a better future. The “Hideous Hypocrisy” of BDS and Pinkwashing.